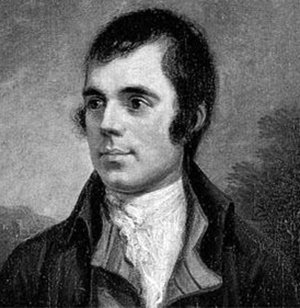 Robert Burns (January 25, 1759 – July 21, 1796), also known as Rabbie Burns, the Bard of Ayrshire and various other names and epithets, was a Scottish poet and lyricist. He is widely regarded as the national poet of Scotland and is celebrated worldwide. He is the best known of the poets who have written in the Scots language, although much of his writing is also in English and a light Scots dialect, accessible to an audience beyond Scotland. He also wrote in standard English, and in these writings his political or civil commentary is often at its bluntest. A brother to relieve,—how exquisite the bliss! That's a' the learning I desire. Nor am I even the thing I could be.